Cooking and baking are among my favorite hobbies as is preparing tea so I have a collection of tea cookbooks and recently the collection grew by one with the addition of Carol Mark's The Love of Tea. The recipes are divided among five categories: starters, mains, desserts, cocktails and afternoon tea. Each recipe is accompanied by a photograph of the ingredients or the finished dish. Although I have not yet prepared any of the recipes I am intrigued by the desserts section. Reverse Earl Gray Chocolate Truffles Best Chocolate Tea Cake. The recipes are short which I take to mean easy to prepare. Non-imbibers will appreciate the mocktail versions of the tea cocktails. Don't Basil Fawelty made with rooibos, basil, and orange and pineapple juices or Red Blitz Blast with rooibos, lemonade, and cherry juice sound refreshing?! (Oh, warm weather dreaming.) And some of the cocktail recipes were designed without alcohol in mind like the Cucumber Sandwich Mocktail prepared with matcha. This one sounds like a drink for afternoon tea. Plan your next home afternoon tea using the recipes in the afternoon tea section. Make classic egg, cucumber, and chicken sandwiches. Bake scones, shortbread, and sponge cake. And don't forget the lemon curd! The Love of Tea is available on iBooks. You can find Carol Mark hanging out on Google+. 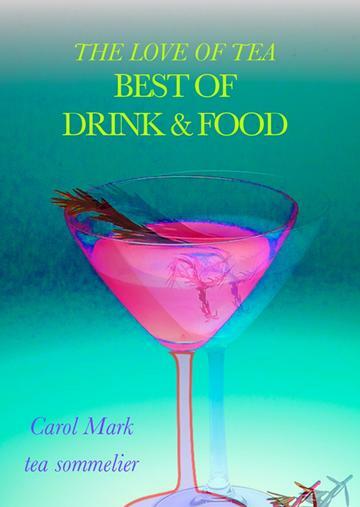 Thank you to Carol Mark for a review copy of the book.